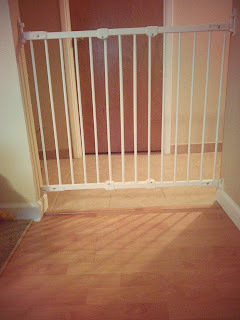 When we bought our house it was set up perfectly to block kids from the kitchen and the bedrooms/bathrooms, but the space in the kitchen between the wall and the counter meant I needed a gate that could mount at an angle. I am so glad this was the case, because it led me to find the best baby gates ever! The KidCo Angle Mount Safeway Gate is the way to go, whether you need to mount a gate at an angle, straight, the top of stairs, or anywhere! This gate truly can be opened with one hand (which if you have kids is 100% necessary), looks nice, and is very sturdy (my toddler stands on it all the time). This gate has some really cool features, like the ability to easily take it off the wall if you want it out of the way temporarily. And it can be mounted/adjusted in a variety of ways to get around any obstacles you might have (Trim, etc. ), and be adjusted to fit just about any space (just not a super huge one). I love how wide this gate opens, allowing you to fit through while carrying car seats, kids, and anything else. And it can open both ways, or be locked to only open one direction (like at the top of stairs). It's also fairly easy to figure out, so even guests are able to use it easily. The only con's with this gate is that it's a little hard to install, and the instructions aren't too clear, but it is totally worth it. It is also hardware mounted, which means you do have to put holes in your wall, but that's the way to go if you want a gate that works, and doesn't have the tripping hazard bar at the bottom). If you want a good, sturdy, easy to use gate that will last, here it is!